Frozen Crown have released a video for the song ‘Everwinter’, the third single taken from the band’s debut album ‘The Fallen King’, out now on Scarlet Records. The band’s video for the second single ‘Kings’ hit 500 million views on Youtube, a great result for a newcomer band, and the future looks even more promising. 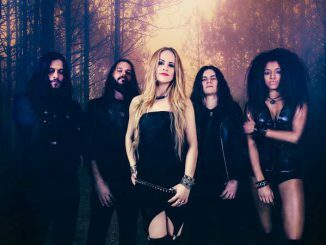 Frozen Crown is a Melodic Power Metal band with female and male vocals, drawing inspiration from early Sonata Arctica and Nightwish, as well as from the most recent European metal acts like Orden Ogan. Between catchy and epic refrains, melodic guitar riffs and vocal duets on a solid Power Metal basis, the band makes frequent incursions in Classic Heavy Metal (Iced Earth, Iron Maiden), Folk and Melodic Death (early Children of Bodom and Dark Tranquillity), occasionally adding screaming vocals. The use of Keyboards enriches the songs and adds an epic edge to them, without being too invasive for the band’s sound, which still remains heavily guitar driven.